Pricing Hierarchy Model - Objective Insights, Inc.
Pricing Hierarchy Model is a tool that has been used successfully by pharmaceutical companies to help set the price for new products. Pricing Hierarchy Model uses the Analytic Hierarchy Process (AHP), which is flexible tool for structuring and solving complex problems. Objective Insights has used Pricing Hierarchy Model for pricing decisions where companies must balance the tradeoffs between multiple financial and non-financial objectives, tradeoffs between quantitative and qualitative objectives, address multiple stakeholders and influencers, and decide between multiple alternatives, options, or choices. The AHP has been applied to many decisions in business and government over the last four decades. An AHP model is typically constructed by a cross-functional team in a group setting, and the very process is just as valuable to the team as the final answer, which can ultimately be presented on one slide. 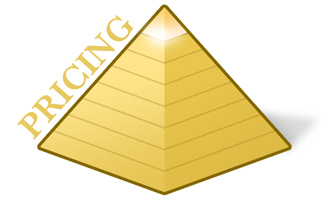 For more information, please download the Pricing Hierarchy Model Overview (pdf).